Every family has it’s traditions. And despite living so far away from our families these past few years, I have continued my family’s holiday baking tradition. You see, we don’t really celebrate Christmas anymore with a tree and presents and all that. But I still do like to make holiday treats for us and others. Growing up, my mom and I always made roll-out sugar cookies, buckeyes, fudge (with and without nuts), turtles (to use up the leftover buckeye chocolate) and peanut brittle. Sometimes she would mix it up and make some other things but these were the good-old standby’s. Over the years, since my celiac disease diagnosis, I still make many of these items, some of which are naturally gluten free, like the fudge, turtles and buckeyes. (I haven’t gotten brave enough to make peanut brittle yet!) And although it has been many years since I have made gluten free sugar cookies and I do love them, I find that I crave other things at this time of year. Chocolate Fudge – Like my mom, I make the Fantasy Fudge recipe on the back of the Kraft Marshmallow Creme. Remember, Kraft clearly labels all ingredients and allergens on their products. Salted Chocolate Chip Oatmeal Cookies – a new-to-me recipe. I would suggest creaming the butter, sugars and eggs together first. I used Amy’s (SS&GF) Basic Flour Mix but I used regular garbanzo bean flour rather than the garfava blend she calls for. It worked just fine! I also added 1/2 teaspoon of xathan gum to the flour mix. Also, if you’re gluten free, make sure to use gluten free oats like those from Bob’s Red Mill (check the label, not all of their oats are GF). Pistachio-Cranberry Biscotti – the first time I have made biscotti, but Amy at SS&GF made it simple. I used her Basic Flour Blend mentioned in her recipe, with the garbanzo bean flour substitution. They are tasty and will go great with my favorite seasonal Celestial Seasonings teas. Peanut Butter-Nutella Thumbprint Cookies – I changed it up (because I didn’t have enough peanut butter) and made peanut butter cookies with GF flour. They are a little dry and crumbly, but the flavor is great. I’ll have to work on these… And I need to practice my Nutella spooning skills. Chai-Spiced Snickerdoodles – Wow! I really like these. It has been a long time since I have made Snickerdoodles and when I saw these I knew I had to make them. Delicious! I used my standard cookie-flour-mix, which is the Gluten Free Pantry’s French Bread and Pizza Mix, cup for cup. It already includes guar gum, so no additional guar or xathan gum is needed. I often find boxes of the GFP mixes (and other gluten free products) on clearance at my local Smith’s grocery store and so I buy them up when I see them. Butterscotch Cookies – a recipe I received in a Gluten Free.com/Beth Hillson newsletter. They didn’t identify the original source. We really like these too and I think I would like them even more without the cinnamon as I think it competes too much with the butterscotch flavor. Cappuccino Thins Cookies – be sure to give yourself time to refrigerate these guys. Great flavor! Again, here I used the Gluten Free Pantry’s French Bread and Pizza Mix flour, cup for cup. Buckeyes! No Christmas holiday is complete without these, at least in our family. You see, I am originally from Ohio and I went to The Ohio State University (OSU). And it’s funny, as I have entered this gluten free blogging world, I have been surprised to find quite a few Columbus, Ohio/Ohio State gluten free bloggers! Amy from Simply Sugar and Gluten Free – we went to OSU at the same time but didn’t know each other until we ‘met’ in the blog world. Kim at Gluten Free is Life – she lives in the Columbus, Ohio area near where my step-grandparents, aunts, uncles and cousins live/lived! Wendy at Celiacs in The House – another Columbus-area, gluten free blogger. And I can’t forget, Heidi, over at Adventures of a Gluten Free Mom – she is actually the only one of these fellow Ohio bloggers that I have met since we now live in neighboring towns, although across the country from Ohio now. We went to OSU during overlapping times but never knew each other there. As well, she grew up in the same Columbus-area town that my step-grandparents, aunts, uncles and cousins lived too! 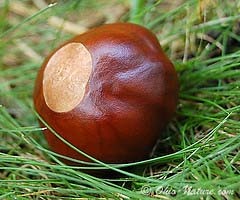 So, you say, what is a buckeye anyway? And why is it the mascot for The Ohio State University? Well, the seed comes from the Ohio Buckeye tree (Aesculus glabra). And for whatever reason, the university claimed it for their mascot in 1965. So, since I am an Ohio State Buckeye, through and through, and I have never known a Christmas without buckeyes, I am sharing the recipe with you here so that you can enjoy them too. 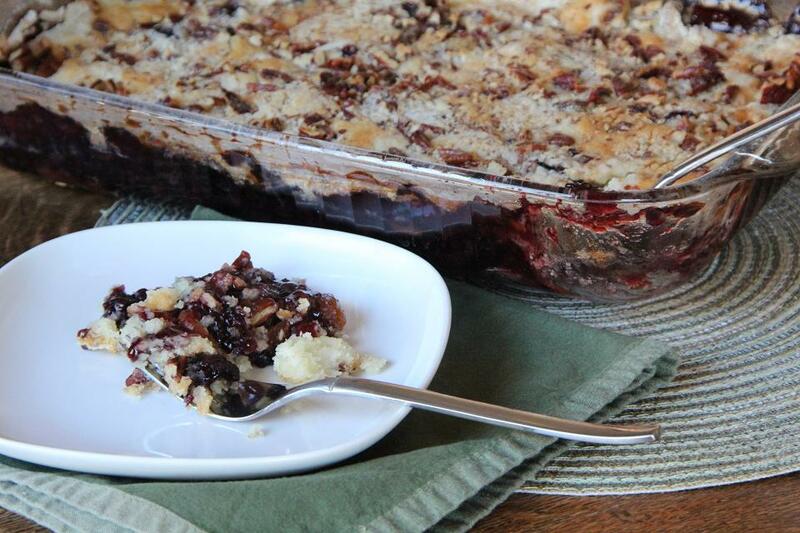 This recipe is the one that my family has made for years. And it does take some practice to keep the ball on the toothpick while dipping. And since my mom hated making these, the only way we got them was if I made them, so needless to say, I have been making them for too many years to count! See the resemblance to the seed above? Mix all the ingredients together in a large bowl using a hand mixer (I would suggest doing one batch at a time to avoid burning up your mixer’s motor). Once the dough is well-mixed and become crumbly, using your hands, make three to four large balls of dough. Then using your warm hands, pinch off small pieces of dough and roll into balls about 3/4″ in diameter. (Make them much bigger and I think they are too peanut-buttery, I like a balance of chocolate to peanut butter.) Place balls on a plate while you complete this task. Stir frequently until it has all melted. Turn off the heat on the pot. Tilt your pot so that you get a deeper puddle of chocolate and your ball won’t hit the bottom of the pot when dipping. Then, carefully, using a toothpick inserted in the top of the ball, dip the ball into the chocolate, so that only about a 1/2″ diameter circle of peanut butter is showing at the top. 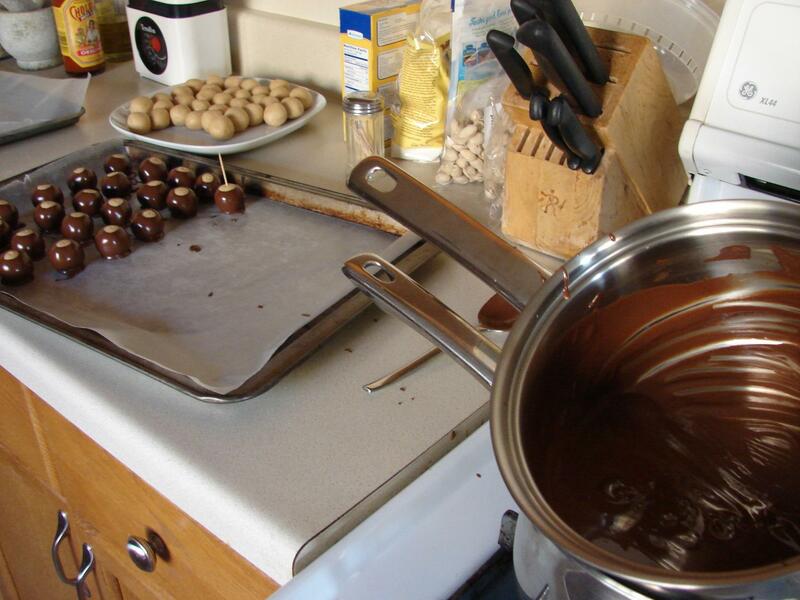 Allow the ball to drip the remaining chocolate back into the pot, while holding it at a slight angle. Place the ball on a cookie sheet covered with wax paper. Carefully, slightly twist the toothpick between your fingers just a bit to get the pick out of the ball, without touching it! 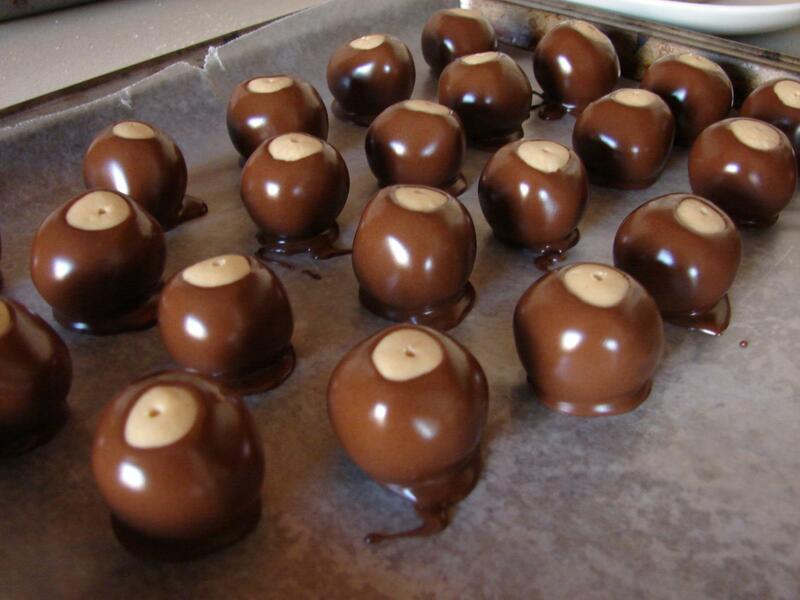 Be sure to start placing the balls at the end of the cookie sheet that is farthest from your pot of chocolate so that you do not drip the chocolate over the finished buckeyes. If you happen to drop one in the pot completely, just use a spoon to fish it out and enjoy! And you can reuse your toothpick, until you accidentally dip one too far and get chocolate on your pick! We leave the toothpick mark in ours, some people don’t. Chill and store in the refrigerator. Makes about 4-5 dozen, depending on how big you make your balls. * I use regular salted butter but unsalted will work too. 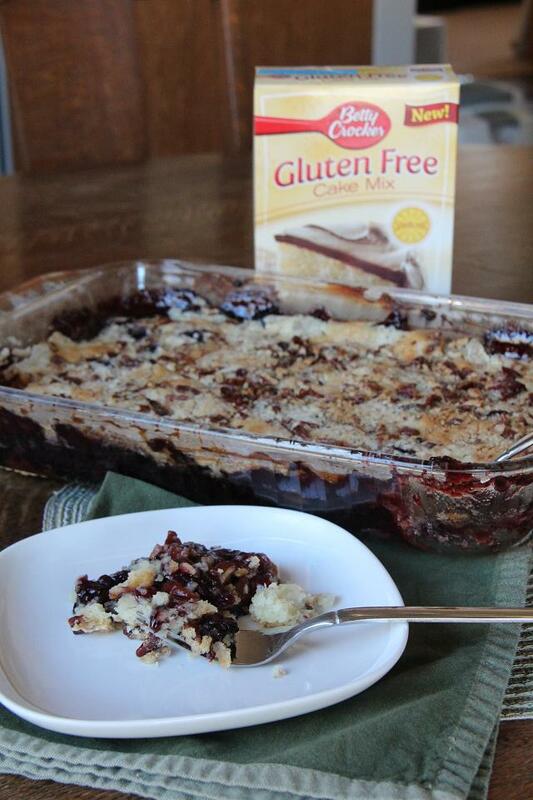 You can also use dairy-free margarine like my pal, Heidi and her dairy-free Buckeyes. * I use regular old Jif or Skippy peanut butter for these. I have never tried natural nut butters and don’t know how they would work. Sun-butter may also work for a nut-free version, but I personally have not tried it. Let me know if you do. * You could use other chocolate, like Heidi, but semi-sweet chips are standard in this family. * Paraffin wax – this is the “old” part of the recipe and is what my grandmother and mother before me have always used. This makes the chocolate pretty and shiny and it hardens better than chocolate on it’s own, making it less likely to melt or slide off the balls. Some people may find this disagreeable. Carnauba wax is a common ingredient in candy bars and such. And paraffin wax is what is typically used on fruits and vegetables to make them pretty and shiny. Paraffin is mineral oil in a hardened form. You can find the edible paraffin wax in your large grocery store, often near the canning supplies. Another option, if the wax bothers you, is to add a couple of tablespoons of vegetable shortening to your chocolate. I personally have never tried this but others have. You could also temper your chocolate (never tried it), or use a chocolate specifically for candy-making, like Wilton’s Candy Melts. Again, haven’t tried it. * I do not refrigerate my balls prior to dipping and I have never had an issue with them in my 25+ years of making Buckeyes! What is your must-make holiday treat? or the one that your husband (or children, etc.) insists upon every year? As I mentioned the other day, I had the opportunity to make some sweets for a couple of events over the past week. 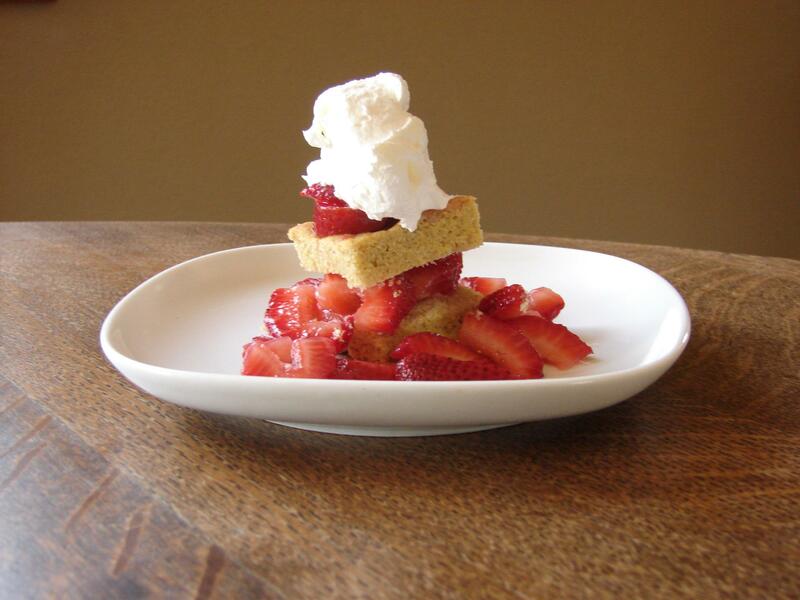 I have been loving the seasonal strawberries and so I decided to try Amy of Simply Sugar and Gluten Free’s Shortcake. It turned out great! The shortcake was very subtly sweetened, allowing the fruit and cream to supply the sweetness. I followed Amy’s recipe to the letter and even used her All Purpose Baking Blend consisting of sweet rice flour, sorghum, cornstarch and tapioca, for the flour mix. It worked well. The cornmeal also added a nice, rustic touch to the cakes that we liked. Since I was baking for a large group (and my husband) I made a double-batch of the recipe and baked it in a 9×13″ glass baking dish. It was the right size dish and made the pieces of cake just the right thickness to cut in half horizontally and layer with berries as we did in the picture above. It looks a little like the Leaning Tower of Shortcake…a little too much whipped cream, perhaps? All in all, a success. And my husband and I even liked eating pieces of the shortcake by itself – not too sweet, just right. Nice job and thanks for the recipe, Amy!